A few months ago, I joined Pinterest after bloggers and friends alike were raving about how awesome/addictive it was. It took me a few months to develop a full-blown addiction, but I can now proudly say that I'm really, really into pinning things! 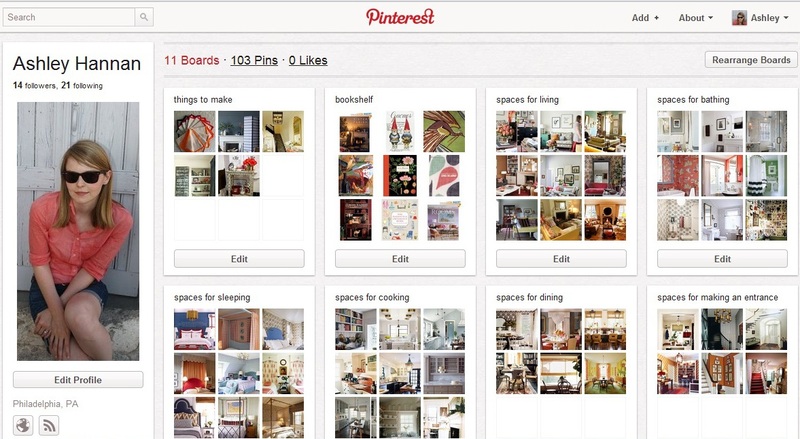 Let's be Pinterest friends, share pretty images, and pin-pin-pin away! i will be following. i hope you follow me too! I know, your boards are so pretty! Yeah! I just started following you. It is addictive, isn't it?? I'm not as organized as you, so my boards are a little, um, jumbled. But I'd love for you to follow me too! I just posted some of my inspirations from pinterest today on my blog. So easy and fun! AHHH, all day. I could pin and pin ALL day. Very addictive. And I love it! Ashley -- I already did, and I'm already loving all the fabrics you pin. You have such an eye for that. Sending you an email about the question you asked. I already follow you! The house go by like minutes. Bad addiction.